Sinuksukang Manok to Chef Boy, stuffed chicken rolls to most of us. And yes, the kitchen idol sfuffs it with all he's got - ham, chorizo, cheese, quail eggs and many moe. Small wonder this chicken flies high as it hits the palate! 6. For cheese sauce: Melt butter in a sauce pan. Add cream and cheese, stirring until cheese is melted. 7. Season with seasoning granules and add spring onions. 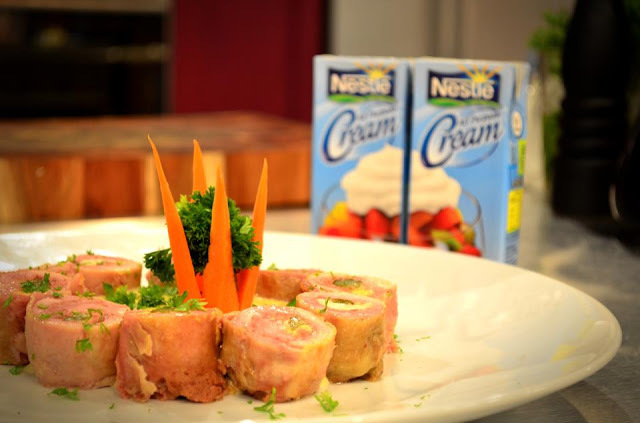 Serve with chicken roulade.